It's that time of year – you're either planning a holiday gathering or recovering from one – or both. 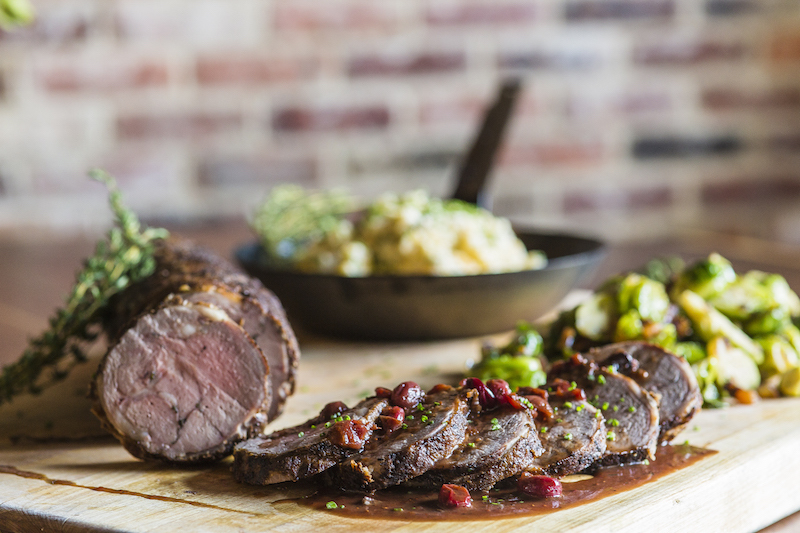 For a new recipe that goes beyond the basic holiday staples, make this Rosemary-Thyme leg of lamb with bacon Brussels sprouts and creamy Southern rutabaga smash by Motor Supply's Executive Chef Wes Fulmer. Trust us – your guests will be impressed. Rinse the rutabagas under cold water. Leaving the skin on, cut each rutabaga into 1/8 pieces. Place the pieces in a medium sauce pot, cover with water, and cook for about 30 to 45 min until tender all the way through, but not falling apart. Strain, place on a cooking sheet, and place in a 250-degree oven for about 8 minutes. Put in a bowl with butter, and with a potato masher, gently break up until it starts to resemble dry mashed potatoes. Add heavy cream and season with salt and pepper to your liking. Bring 2 gallons of salted water to a boil. Add in Brussels sprouts and cook about 1 ½ to 2 minutes until a little soft and bright green. Immediately transfer to an ice bath to cool completely and pat dry. Render the pork jowl in a sauté pan on low heat, stirring often until just under crispy. Strain the jowl, reserving the fat. In a large sauté pan, sweat out the red onion until translucent. Tuning up the heat to medium, add the jowl fat and Brussels sprouts, then the jowl and chili flakes. Season to taste before serving. Preheat oven to 275 degrees. Rub the leg with olive oil and apply salt, pepper and half of the chopped herbs. In a large sauté pan on high heat, sear the lamb on all sides to golden-brown, being careful not to burn. Rub once more with olive oil and transfer to a roasting pan with a rack. Roast in the oven at 275 degrees for about 45 minutes to 1 hour until internal temperature reaches 135 degrees. Take out of oven and out of roasting pan to let rest for 30 minutes.